Wow. I can't believe another year has gone by. It seems like yesterday I was starting high-school and now there's only 6 months left before I graduate. I just wanted to tell everyone how excited I am for finally deciding to keep up my blogging and to use blogging as a means of relating with people that have the same interests and passions as I do. I hope 2013 will bring me just as many rewarding moments as 2012, and even more. I always come to the realization that no matter how many troubles one has to face and how unhappy one might be, there are always things to look forward to, goals to set for the future. Time flies by and we might end up one day seeing how our life has passed by us. Every year we have the chance to refresh ourselves, to clean the mess we did during the previous year and try to make everything better, try to evolve. We might not get to do all the things we want to, but having ambition, wishes and aspirations is the best way to get through life. I wish everyone a very merry 2013, and I hope we can stick together in the next year as well. Remember, New Year's Eve is a time to spend with friends, family and people you want to see, people you love and cherish. 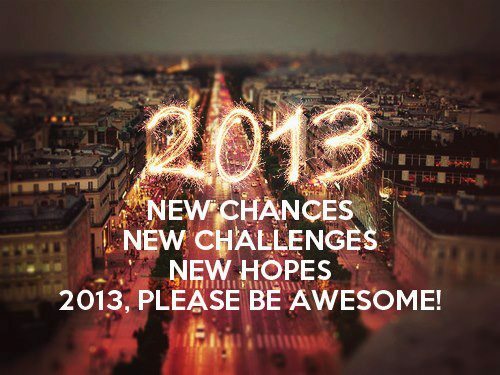 I can't wait for 2013 either! It will be amazing to graduate. I'm also counting down the days!